GloMelt™ dye can be used to detect protein unfolding or measure thermal stability by performing a thermal shift assay, also called Protein Thermal Shift™, differential scanning fluorimetry, or Thermofluor assay. GloMelt™ dye undergoes fluorescence enhancement upon binding to hydrophobic regions of denatured proteins. 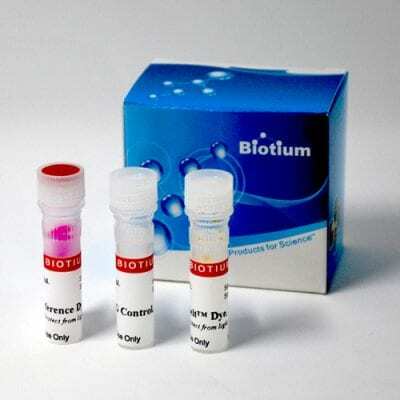 Therefore the dye can be used to detect protein unfolding or measure thermal stability by performing a thermal shift assay, also called Protein Thermal Shift™, differential scanning fluorimetry, or Thermofluor assay. 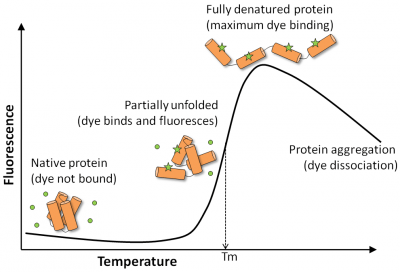 Environmentally sensitive fluorescent dyes can be used to monitor the temperature dependent unfolding of a protein. 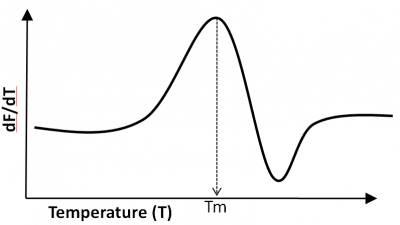 The protein’s melting temperature (Tm) is a reporter of the protein’s thermal stability. 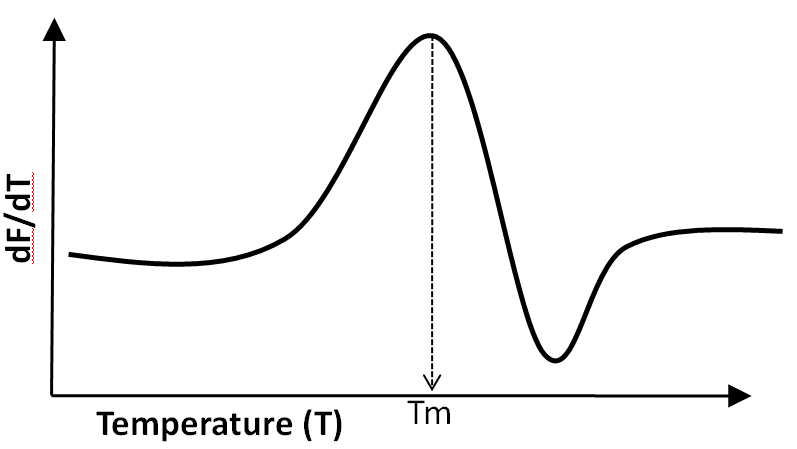 The thermal shift assay is a rapid and inexpensive technique that quantifies change in protein denaturation temperature, and thus can be used to screen conditions that affect protein thermal stability, such as protein mutations, ligand binding, and buffer formulations (like pH, salts, detergents, and other additives). These assays are rapid (typically about 30 minutes) and are performed on a quantitative PCR system. 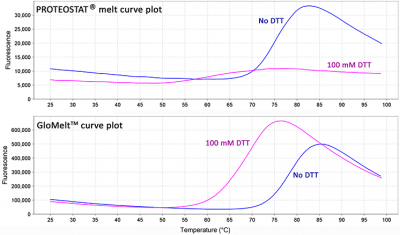 The thermal shift method is compatible with high throughput screening and requires much less protein than methods such as circular dichroism and differential scanning calorimetry. GloMelt™ dye has significant advantages over other environmentally sensitive dyes, such as SYPRO® Orange and PROTEOSTAT® TS dye. GloMelt™ dye generates a strong signal because it is optimized for detection in the SYBR® Green channel of qPCR instruments, and therefore low reaction volumes and low protein concentrations can be used. GloMelt™ dye is compatible with high concentrations of protein stabilizers (such as glycerol and sorbitol), and also protein destabilizers (such as DTT and imidazole). GloMelt™ dye performs very well in high detergent concentrations, unlike SYPRO® Orange. 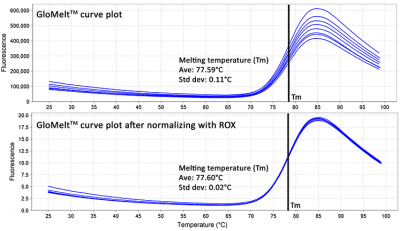 Another advantage is that ROX dye can be included with GloMelt™ dye during thermal shift assays, which improves results by increasing replicate consistency in PCR instruments that require ROX passive reference dye. 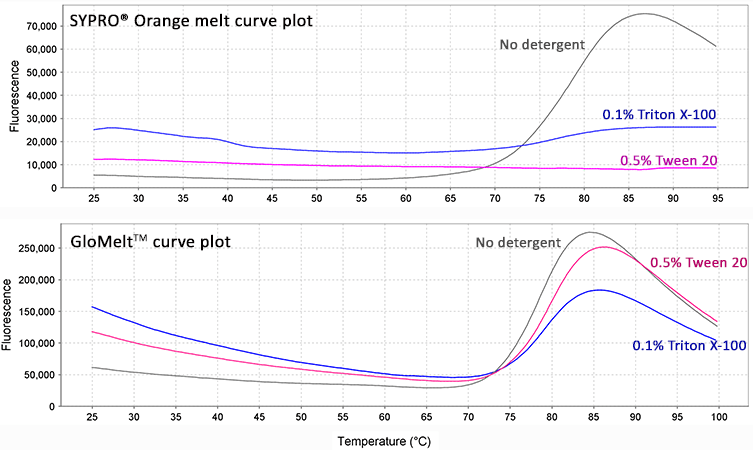 IgG melt curve plots in the presence of detergent. A thermal shift assay was performed on 20 ug IgG in the presence of 5X SYPRO® Orange or 1X GloMelt™ dye, using a QuantStudio™ 5 qPCR system. 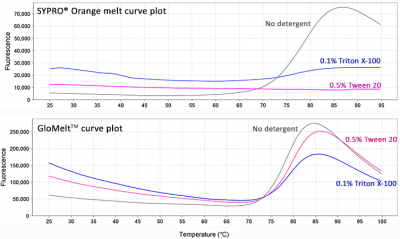 The presence of detergent inhibited the SYPRO® Orange assay, but did not significantly affect the GloMelt™ curve. 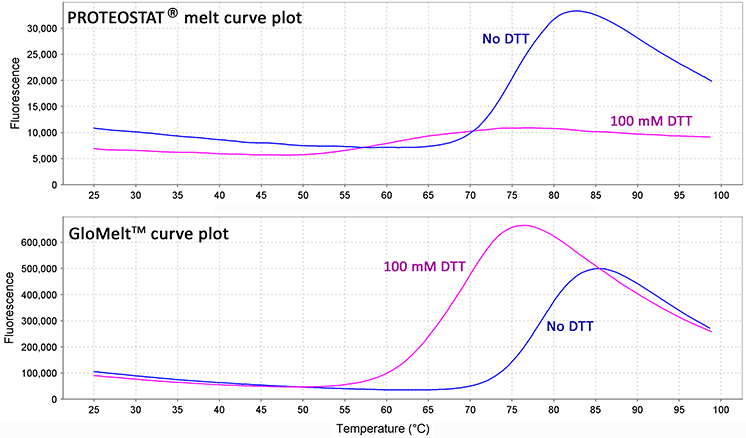 IgG melt curve plots in the presence of DTT. A thermal shift assay was performed on 25 ug IgG in the presence of 1X PROTEOSTAT® TS dye or 1X GloMelt™ dye, using a QuantStudio™ 5 qPCR system. The presence of DTT drastically reduced the sensitivity of the PROTEOSTAT® assay, but had little affect on the GloMelt™ dye. As expected, DTT reduced IgG thermal stability. Normalization with ROX reference dye can improve results by increasing replicate consistency. 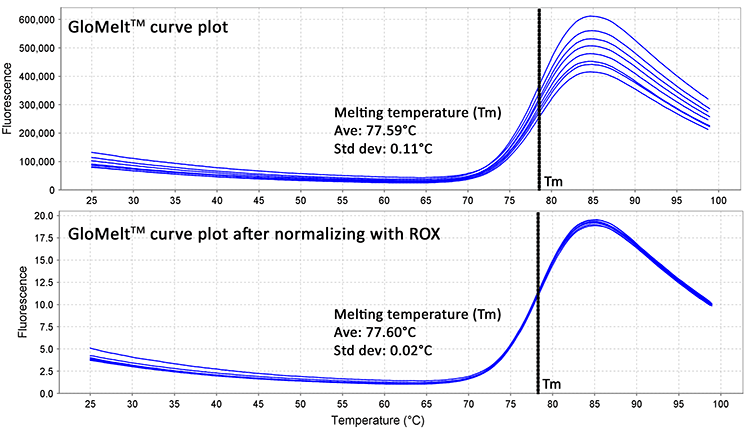 A thermal shift assay was performed on 20 ug IgG in the presence 1X GloMelt™ dye and 50 nM ROX. After ROX normalization the standard deviation was reduced more than 5-fold. Small molecule inhibitors of bromodomain proteins have shown therapeutic effects in cancer models. Here, a GloMelt™ thermal shift assay was performed on 10 ug bromodomain BRD2 in the presence of bromodomain inhibitors ( )-JQ1 or RVX-208. Inhibitor binding stabilized the protein as indicated by the shift of the melting curves. Protein Thermal Shift and QuantStudio are trademarks and SYBR is a registered trademark of Thermo Fisher Scientific. Proteostat is a registered trademark of Enzo Life Sciences.